Michael Spooner, ‘Playground: a manifesto for giants’, Royal Australian Institute of Architects (RAIA) COLORBOND steel Student Biennale Prize Winner, 2006. The RAIA Colorbond Steel Student Biennale Prize is the preeminent award for students of architecture in Australia. The RAIA required the traveling exhibition catalogue and exhibition panels to carry a label stating that ‘Exhibition material contains sexual references that may offend,’ continuing the long held representation of ‘queer’ as a threat to the wellbeing of ‘the rest’ of the community. No other exhibitor was required to have a label despite their potential to offend being no less or more known than my own. Ultimately the judging panel should be praised for understanding the proposition as a claim – irrelevant of its seriousness – to the politics of space. 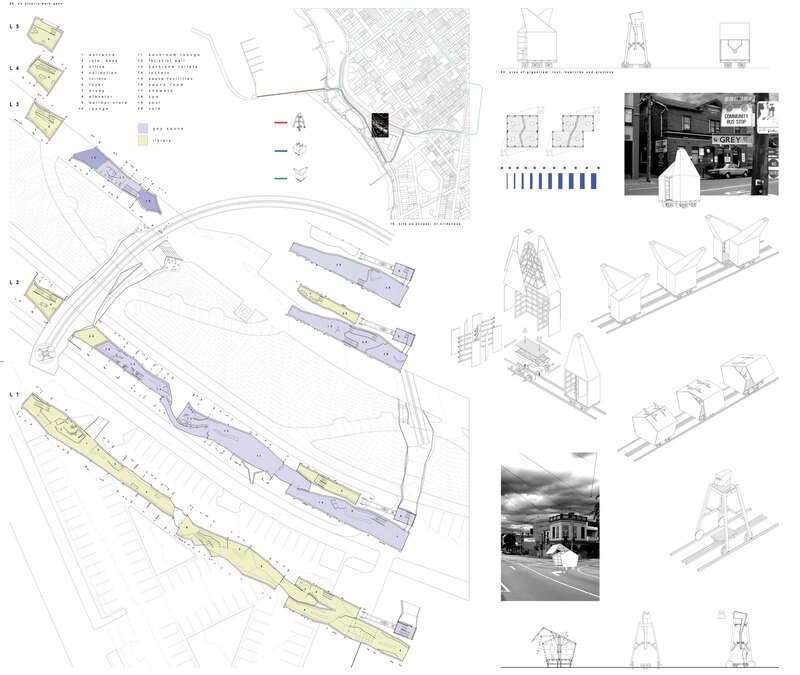 The project sought to engage with all manifestations of play, scrutinize the spectacles, compositions and genres that reflect the complex and peculiar image of seaside suburb of St. Kilda, Melbourne and critically engage with the future initiatives of the councils development plan which envisaged a whole, rather than fragmented St.Kilda. The project is located on a site adjacent to the notorious ‘Palace’ and historic ‘Palais’, and Melbourne’s carnival complex ‘Luna Park’. The adjacent triangle carpark site has been highlighted in the councils proposed foreshore redevelopment plan as a key focus of any urban initiative. In realising a whole St.Kilda, the council proposal negates the very existence of a present ‘st.kildaness’, one that emphasises a distinct figure of sewn together parts, the spectre of Frankenstein. Through this manifestation, the giant that Frankenstein was reveals the carnival ground of Luna Park as a slain giant. Its uncanny disembodied head with mouth agape and its grotesquely articulated body becomes the object of an excess of play, its structures ‘queered’. As a site of excess, of an excessive textual play, the queer slips between breaking the rules or ruining the game, to a social identity and as a proclamation of exclusion. Its exclusion is due to its excessiveness – its sins of gigantism. These are rendered through the masked figure of a sauna complex, misplaced into the existing ordering system of a community Library. Further play-toys implement the sins of gigantism as a form of urban spectacle. Their distinct paths converge on the St.Kilda Pier – a reaction to the current ‘heritage project’ of the kiosk rebuilding, which will exist as an architectural figure of denial: the denial of the giant as an object of play. Putting a mirror up to St Kilda, sexual isolation and reinvention, and the curious symbolism of Luna Park, Spooner takes us on an intense and highly personal journey. In this, he analyses the nature of play and of homicide, lust and gluttony. He shows a critical engagement with the place, acknowledging its gutsy fragmentation (its “St Kildaness”), now under threat from authority and homogeneity. This is a design that defends the place of otherness and excess, providing an exotic locale and mementos within a “big dipper” framework. It lifts the lid on another world, and the approach is courageous, imaginative, inventive, subversive.